Almansa Ruiz JC, Jonker A, Bosman AM, Steenkamp G. Bacterial profile and antibiogram of the bacteria isolated from the exposed pulp of dog canine teeth. Vet Rec. 2018;183(3):97. 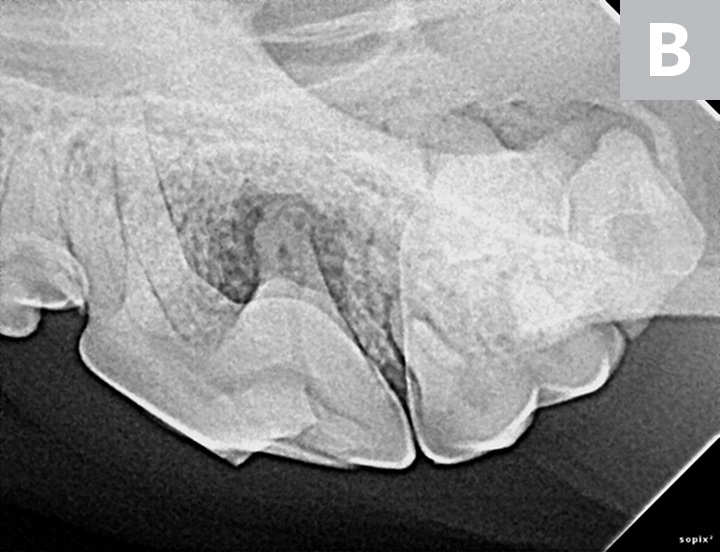 This study isolated and identified the bacteria present in the root canals of dogs with nonvital pulps exposed as a result of complicated crown fractures. 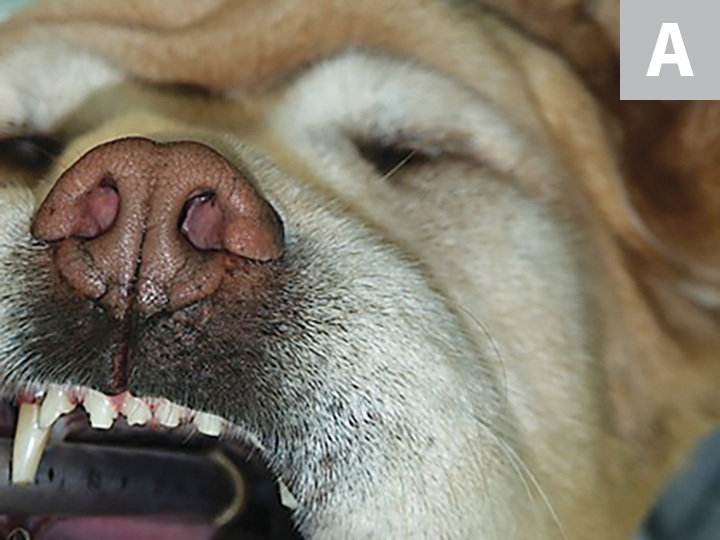 Twenty-seven samples were obtained from the root canals of canine teeth from 20 dogs, and culture and susceptibility testing was performed. Positive cultures were reported in 92.59% of samples; of these, facultative anaerobes were most commonly isolated (77.56%). Aerobes and strict anaerobes were isolated in 18.36% and 4.08%, respectively, of the remaining samples. Susceptibility testing of aerobic and facultative anaerobic bacteria showed gentamicin and enrofloxacin to be most effective. 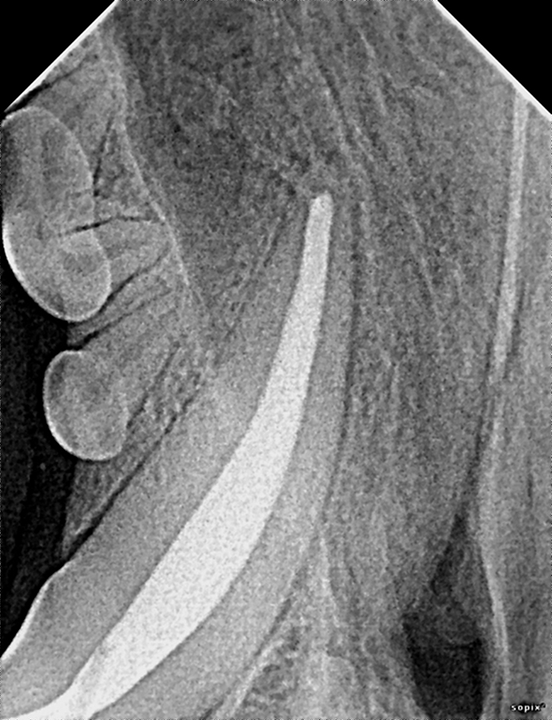 Treatment of complicated crown fractures with systemic antibiotics is generally unnecessary and ineffective. Systemic antibiotics rely on circulation to bring the active drug to an infected site that may no longer possess a normal blood supply, as seen in teeth with nonvital pulps. Intracanal antibiotics may be more effective for delivery into the endodontic system. Exceptions for systemic antibiotic use include patients with clinical signs (eg, significant and painful facial swelling, draining tracts, pyrexia); however, treatment of the tooth would still be indicated in these patients. Although susceptibility testing is preferred when using systemic antibiotics, empiric prescriptions are more realistic in clinical situations due to the time delay for culture results. Studies such as this can provide insight into the typical endodontic microbiota and help guide empiric use of systemic antibiotics when their use is necessary. FIGURE 1 Complicated crown fracture in a dog. Bacteria from the oral cavity will quickly colonize the root canal system. FIGURE 2A Severe facial swelling from a tooth root abscess of the maxillary left 4th premolar tooth (A). Large periapical lucencies are visible on the radiograph of the 4th premolar tooth (B). FIGURE 2B Severe facial swelling from a tooth root abscess of the maxillary left 4th premolar tooth (A). Large periapical lucencies are visible on the radiograph of the 4th premolar tooth (B). FIGURE 3 Completed root canal therapy of a canine tooth with a complicated crown fracture. Debridement of the canal, followed by disinfection and obturation, will eliminate or trap any bacteria in the root canal system. Clinicians should remember that complicated crown fractures will result in bacterial colonization in the root canal system. Infection and unnecessary pain in patients is best avoided through prompt treatment of a broken tooth; watching and waiting is not an appropriate action plan. Treatment options include extraction and endodontic therapy. Extraction may be elected if there is minimal remaining tooth structure, significant facial swelling indicating an end-stage periapical infection, or radiographic evidence of significant root pathology. If the behavior that caused the complicated crown fracture cannot be corrected, extraction may be the best option. When maintenance of the tooth is desired, root canal therapy is indicated. Endodontic treatment should be performed by a board-certified veterinary dentist to eliminate bacteria in the root canal system through debridement, disinfection, and obturation of the canal, followed by restoration of the crown fracture site. Although the bacteria isolated in this study were susceptible to antibiotic treatment, this does not correlate to clinical treatment of complicated crown fractures. Ferreira FB, Campos Rabang HR, Pinheiro ET, et al. Root canal microbiota of dogs’ teeth with periapical lesions induced by two different methods. Oral Surg Oral Med Oral Pathol Oral Radiol Endod. 2006;102(4):564-570. Kuntsi-Vaattovaara H, Verstraete FJ, Kass PH. 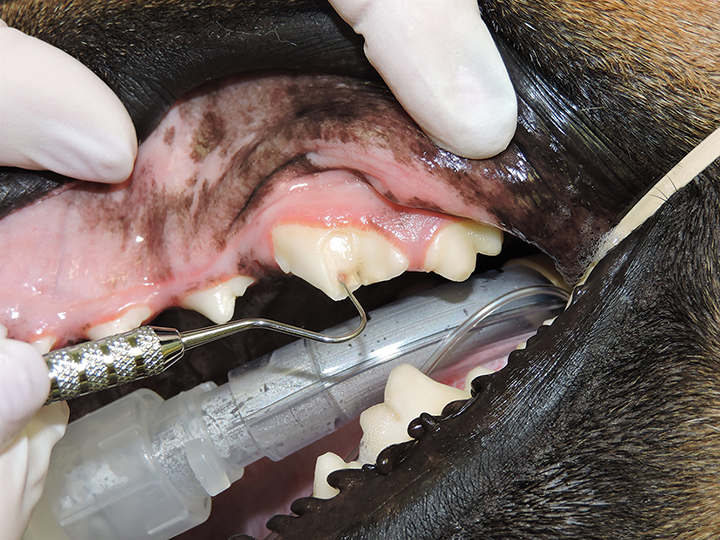 Results of root canal treatment in dogs: 127 cases (1995-2000). J Am Vet Med Assoc. 2002;220(6):775-780. Mohammadi Z. Systemic, prophylactic and local applications of antimicrobials in endodontics: an update review. Int Dent J. 2009;59(4):175-186.